So this is a series of super yachts which is having a lot of success since some years, and finally we see a builder from USA challenging in it, that for a 27 to 28 meter raised pilot house and semi wide body design. For entering in this segment Ocean Alexander asked for USA designer Evan Marshall, who presented the project fro the 90 Revolution. The USA designer and Ocean Alexander in the 90 Revolution presented a super yacht full of European echoes but with something different to it. The Ocean Alexander 90 Revolution comes with a standard layout of a main deck master stateroom, while the lower deck options offer three variants, two for three cabins, and one for four cabins. 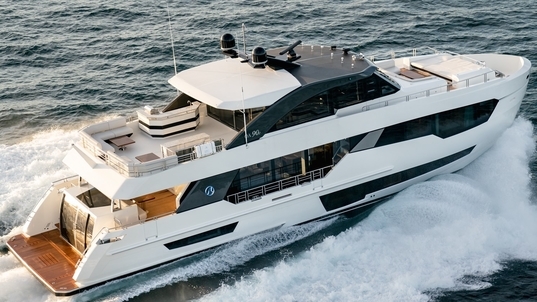 The 90 Revolution also scores heavy points for its aft crew cabins and lobby design, which includes a small galley and L-shaped sofa, two cabins, and another smaller L-shaped sofa. The Ocean Alexander 90 Revolution is powered by twin MTU 1920hp, and Open bridge version is also available.